With any key version of some popular product, a user wants to take not only minor upgrades but as much principal advantages as possible. The new Handy Backup 8 fulfills these wishes, bringing new simplicity, elegance and even more speed than before to this best-selling software solution for data backup and recovery. Handy Backup 8 greatly enhances the speed of data exchange, especially for cloud plug-ins. Independent tests indicate speeding up to 27 times for backing up multiple files to a cloud, and up to 9 times for cloud recovery. Novosoft, LLC presented a newest Handy Backup 8 — a featured backup and recovery solution for Windows and Linux. The new main version 8 brings the re-designed GUI, allows making tasks in simple or advanced mode, enhances quickness and simplicity for installing and taking minor updates, speeds up backup actions up to 27 times and recovery up to 9 times, and contains some renewed plug-ins including those for Oracle and MS SQL databases. 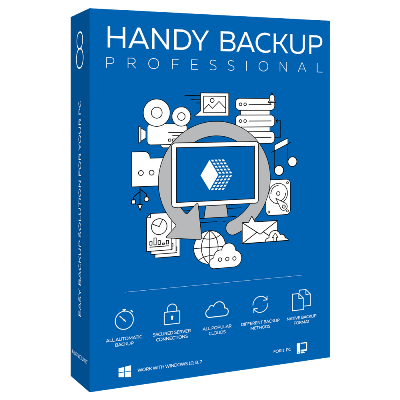 «For Handy Backup 8 we collected all the best of our experience for many years of backup software development. We enhance the graphical interface to make it modern-looking and even simpler than before. Also we increase the speed of backup and restore, and made installation and updating actions more quick and efficient», — tells Natalia Sigaeva, the Head of Handy Backup Team. The new Handy Backup 8 contains a renewed graphical user interface (GUI) in the unified color scheme. All principal actions now require only a single click. For fine-tuning tasks and options, the main and context menu are available, as well as different message and dialog windows. The new GUI is even simpler and user-friendly than before. Another big difference of the new version is a New Task Wizard. For now, you can switch between simple and advanced wizard modes. The simple mode allows setting up only the most principal task functions: data source and destination, encryption, basic scheduling and final settings including the task name. This mode does not use complex settings, will make no distraction for a user. In the advanced mode, a user can set up all functions and features for a task, including backup type, triggering by a system event, running other software along with a task, etc. This mode has some extra steps for setup but provides full control over a task. The new version simplified the installation. It is only a few clicks required to install Handy Backup 8 with standard setup parameters, a very useful addition for those people who administer several machines or a entire local network! In addition, Handy Backup 8 simplify upgrades: this is no longer need to download a minor update directly from a website. The program will download all necessary updates and run an installation process just by clicking an updating button. For MSSQL and Oracle plug-ins, any registered DBMS administrator can make backup and recovery, not only a system administrator as before. To establish a connection with these DBMS, renewed plug-ins use the configuration dialog allowing connecting to a database on a logical level, instead of direct file copying from a local computer. Finally, Handy Backup 8 greatly enhances the speed of data exchange, especially for cloud plug-ins. Independent tests indicate speeding up to 27 times for backing up multiple files to a cloud, and up to 9 times for cloud recovery. Novosoft, LLC specializes on software development for individual users and business. Its main areas of competency are automation of business processes, system integration and dedicated software development. Among the most popular company products are the modular solution for enterprise resource planning NERPA ERP unified data backup software Handy Backup. The Handy Backup software solution is the unified backup, recovery and synchronization tool. Handy Backup allows saving and restoring databases (SQL and non-SQL), cloud services (such as Amazon S3, Google Drive, Microsoft OneDrive and Dropbox), virtual machines, websites, files and folders (with “hot” backup for locked files and a possibility to include/exclude a file or folder by mask of file name), disk images and almost any other data types ever existing. This software supports any modern versions of Windows, including Windows 10/8/7/Vista, Windows Server 2016/2012(R2)/2008(R2), and Ubuntu Linux 14.04/16.04. The modernized easy-to-use GUI provides complete control over creating and executing backup, recovery and synchronization tasks. The network version of Handy Backup provide an effective work in domain, non-domain and heterogeneous networks. Different editions of Handy Backup are available to suit the needs of any users. The primary difference between editions is a set of plug-ins directly available out of the box. One of these solutions also provides centralized network backup over a single management console.